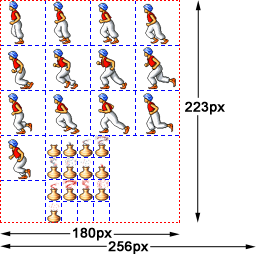 Continuing with my extensions to Apple's Texture2D class, this post is about extending the sprite sheet functionality in part 2 to render sprites of arbitrary size indexed by an atlas. 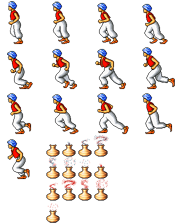 This is more flexible than having all sprites of the same dimension, laid out uniformly in a large texture image. You can even have overlapping sprites and do other funky things as you're in full control over exactly which part of the texture to render. It's useful to have all the sprites that are contained within a texture and their bounding rectangles in a single place, keyed on something useful like a name, for more readable code and ease-of-use of the sprite atlas. The natural choice is to put it all in an NSDictionary, with NSString keys and NSValue values, each containing a CGRect. Using the example texture atlas above, which has 13 different sprites of the prince and 13 of a magic potion, I updated the example code on github to render an animated figure and an animated magic potion. Have a look at the additions to MyTexture2D class, the new textureatlas.txt file and the additional code in TextureExtAppDelegate. When a retina display is being used, it's useful to provide a texture of double the resolution for improved clarity. Please note that with this implementation, the texture atlas uses non-retina co-ordinates for everything, but double-size texture images are used if available (using Apple's @2x convention).